The reverse side of a one ounce Krugerrand, featuring a male springbok . A Krugerrand is a South African gold bullion coin. The Krugerrand is legal tender in South Africa with a face value of 10 rand, but its intended use is as an investment vehicle. 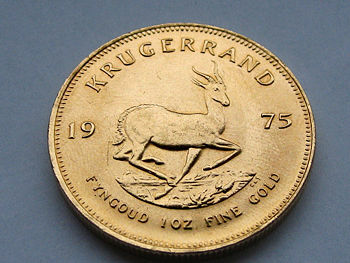 There are several sizes of Krugerrands; the original consists of one troy ounce of gold (31.1 grams). Some 54 million Krugerrands have been minted since 1967, representing 42 million ounces of pure gold. There was originally only one denomination, but since 1980 denominations of 1/2 ounce, 1/4 ounce and 1/10 ounce have been minted. Only the original, one ounce Krugerrand is popular among investors, as it sells with the lowest premium. Krugerrands are typically available to investors at a premium of 4% to 5% for quantities of 100+, and about 10% for single pieces. The lesser Krugerrands are mostly popular among collectors. It was illegal for citizens of the United States to buy and own gold bullion until December 31, 1974, but from 1975 and onwards the Krugerrand became quite popular in the USA. It was also popular in Europe, where its status as legal tender ensured that it could be traded without VAT. The international community put pressure on the apartheid regime of South Africa in the 1980s, and Ronald Reagan banned the import of Krugerrands into the United States in 1985. Most European and Commonwealth nations imposed similar restrictions. Congress lifted the ban in 1994, but the Krugerrand has since struggled to regain its former popularity, in competition with other gold bullion coins such as the U.S. Gold Eagle and the Canadian Gold Maple Leaf. Most numismatics would not consider the Krugerrand an aesthetically pleasing coin, but it is certainly not intended as such. It is rather meant to be a practical substitute for gold bars. Some copper is added to the Krugerrand to make it more resistant to damage, so its actual weight is about 33 grams. The Krugerrand is named after Paul Kruger, president of the Transvaal Republic 1880–1904. His face is shown on the obverse side of the Krugerrand. As of January 2008, an ounce of cold and thus a Krugerrand is worth about USD 833 (GBP 419). This page was last modified 13:26, 8 June 2009.